We’ve had quite a long stretch of cold weather for Colorado. Going into the last stretch of sub-zero weather, I wasn’t sure that the bees would make it. Once again as Diana has to keep reminding me, I worry too much. 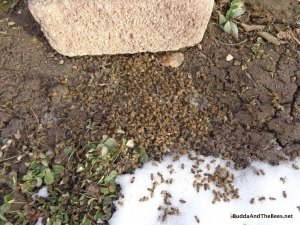 Finally, the chinook winds have kicked in and we’ve made it up into the 50’s and 60’s the past few days so the bees have been able to come out and spread their wings. Normal highs are in the 40’s, but it’s more typical to have some nice warm days, even in February. As a friend said to me today, the record high for today is 70 and the record low is -11, so I’ll take 60. For those of you in the East who have been suffering through a miserable winter, I’ll just say this is why I live in Colorado. The bees have been busy clearing out the less fortunate from the hive. They go around the hive, collect the dead and drag them out. It reminds me of the “bring out your dead” scene from Monty Python and the Holy Grail. It’s normal for many bees to die over the winter, but it’s shocking to see how this all adds up over the course of the winter. In this photo, I estimate there are at least a thousand or more that have accumulated in front of the hive and around the bee yard. Since it was a fairly nice day today, I decided to peek inside the hive and see if they had eaten any of the fondant and check if they still had honey. They haven’t touched the fondant, so I decided I’d check a few bars in to see if they had any honey. That last couple of bars were empty, but the thirteenth bar had lots of capped honey. So, I decided to move that one and see what the next one looked like. But thirteen is unlucky and the comb broke off from the bar. Fortunately, it didn’t collapse completely, so I just propped it up and moved the other bars back to hold it up. It looks like they’ll have enough to make it through as long as it doesn’t stay cold for too long. There were a bunch of dead bees on the bottom of the hive that hadn’t been cleared out. I enjoy watching the undertaker bees struggle to drag the dead out of the hive and deposit them on the pile. Sometimes they struggle more than I think they should, but they must have a plan. Sometimes, it looks like the one they are dragging out is struggling against them, like they are saying, “I’m not dead yet!”. Here’s a video of the activity in front of the hive today (and Yoda the cat slinking by in the background). Notice the one undertaker bee who drags a dead sister through the others loitering on the landing board and tumbles down into the pile of the dead out in front. I didn’t get it on video, but there were several bees coming in with pollen in their baskets. Where they found that I haven’t a clue. But before long, Spring will arrive here with fresh pollen. But it will also bring temperature swings and snows that will test the will of my bees to survive. For now, they seem happy to take their poop flights and bring out the dead.